Thunar is a new modern file manager software for the Xfce Desktop Environment. Thunar has been designed from the ground up to be fast and easy-to-use. X File Explorer (Xfe) is an MS-Explorer like file manager for Linux. It is based on the popular, but discontinued, X Win Commander. ROX-Filer is a fast and powerful graphical file manager. It has full drag-and-drop support and background file operations, and is highly configurable. 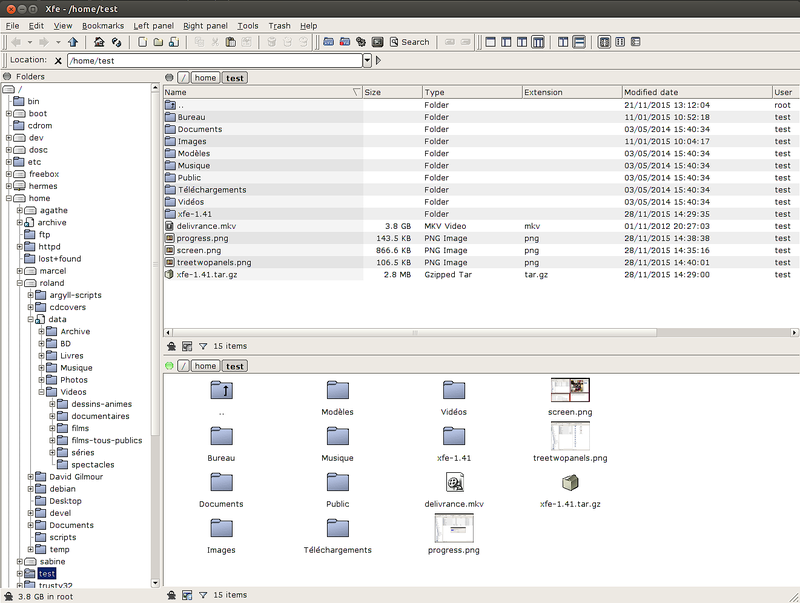 Konqueror is the standard file manager of KDE. It features everything from simple, every-day tasks to much more advanced functions. 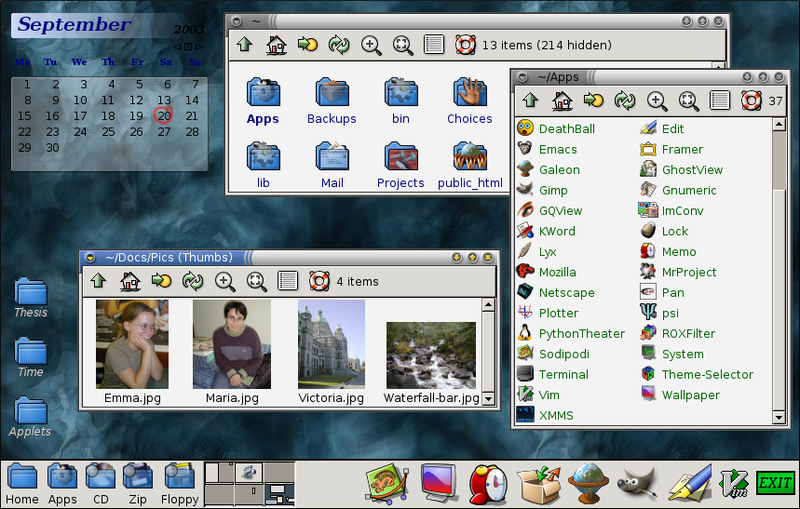 Nautilus is the standard file manager of the Gnome Desktop Environment. It has very advanced features, yet is very easy-to-use. It is free software under the GPL. Dolphin is a file manager for KDE which is similar, but not equal, to Konqueror. It is part of KDE. PCMan is a very fast and lightweight file manager for Linux which features tabbed browsing and a user-friendly interface. GNU Midnight Commander is a feature rich full-screen text mode file manager for Linux. It is freely distributable software under the GNU GPL. Krusader is an advanced twin panel (commander style) file manager for KDE and other desktops in the Linux and Unix world, similar to Midnight or Total Commander. GNOME Commander is a "two-pane" graphical file manager for the GNOME desktop environment. Vifm is a ncurses file manager for Linux with vi-like key bindings. emelFM2 is a file manager that implements the popular two-pane design. It features a simple GTK+2 interface, a flexible file typing scheme, and a built-in command line. Worker is a file manager for the X Window System on Linux. 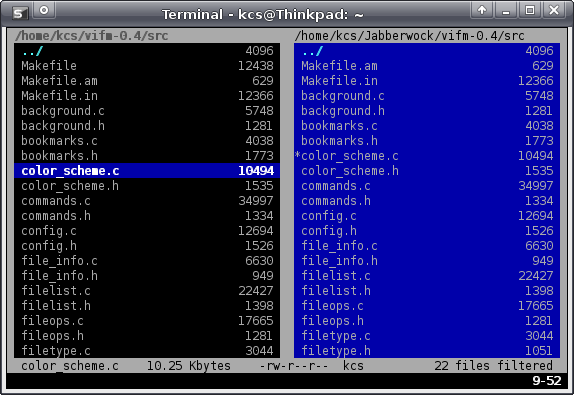 The directories and files are shown in two independent panels (similar to Midnight Commander). gentoo is a graphical filemanager for Linux and Unix-like operating systems. It is written in C and uses the GTK+ toolkit (but not GNOME). It's fast and very configurable. Endeavour Mark II is a complete file management software suite that comes with a file browser, image browser, archiver, recycled objects system, and more.